LEN - www.lankaenews.com | Preliminary steps to help Chathurika launch a TV channel ! Vimukthi and Nimal resign !! 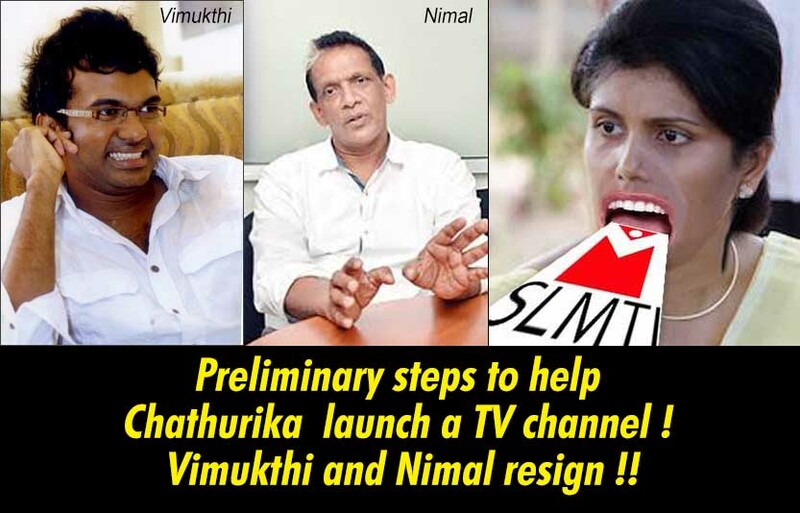 (Lanka e News -22.June.2018, 7.00AM) As a first move of the most cruel conspiracy of president Gamarala which aims at launching a TV channel for Chathurika after sinking the Rupavahini internal training division alias ‘SL mass media training Institution’ which has been training television artistes for the last 36 years, on the 19 th measures were taken to oust its chairman Vimukthi Jayasundara a world renowned award winning cinema director and its director general Nimal Ekanayake a popular senior media personnel. It is with deep regret we are reluctantly compelled to break this most sorrowful news to our viewers. The presidential secretary and notorious Sarath Kongahage the chairman of the Foundation Institute summoned Vimukthi and Nimal on the 19 th and instructed them to bring the training Institution under the Foundation Institute. Foundation Institute is another Institution under a chairman, and Rupavahini training Institute is another Institution also under a chairman. Even to talk about bringing one Institution of two similar Institutions under the other itself is ridiculous and ludicrous. Training Institute chairman Vimukthi had cited an interesting example in this connection. ‘ A car can belong to another person , but can a car belong to another car ?’ he had questioned. To the conspirators none of these had mattered. Their need was to produce an old deed and show that the Rupavahini training Institute land belongs to the Foundation Institute. It is a pity the conspirators haven’t the basic knowledge to understand that this is an issue which can only be resolved in court and not by the president’s henchmen. What the president wants to do is , bring the training Institute under his infamous henchman Kongahage , and with the aid of a foreign investor make that another TV channel to be brought under the administration of Chathurika. When the chairman and the Director General of the training Institute had questioned about the fate of the children who are currently learning , Kongahage had said , as that was first launched by the Foundation Institute , and as the latter has enough funds , the students’ training will be continued. It is very evident there are no honest intentions in this move because , after ousting a most renowned cinema academy director and a most popular Television media personnel , the Rupavahini media training is going to be entrusted to a brief-less lawyer who never won a case in his whole career except that he had a case of a different sort with an actress. Finally Vimukthi and Nimal who did not wish to degrade themselves least of all before conspirators resigned their respective posts. With them two more directors , Sonesh Bandara Dissanayake and Prageeth Mayingamuwa have also decided to tender their resignations. Following our timely exposure , the transaction could not be put through the following week . But now the stumbling blocks have been cleared. In truth what ought to be done is not wreaking havoc on an Institute that existed for 36 years , rather amalgamate it with another world educational Institution and raise it to the level of a University of international standard and repute which will attract students of other neighboring countries. It is well to remember the Institute’s 36 years old history is most paramount . But what is going to be done now is the converse. Even as Gamarala was making the surreptitious moves to take this over from the media ministry , it was for the UNP and the media minister Mangala Samaraweera to raise objections. Sadly , until today there had been no such opposition. In those circumstances there is not much Vimukthis and Nimals can do alone . Nevertheless the mass media which thinks this National asset should be rescued for the past students and the present ,can certainly defeat these conspiratorial actions targeted against the media. This training Institute that was taken out from the media ministry should have been given over to the higher education ministry . Thereafter , it could be preliminarily started as a faculty under the Colombo University . Or else , by providing the necessary government assistance it could be made an independent higher education Institution with facilities for further improvement . Instead, by trying to bring the Institution under the Foundation Institute which is steeped in corruption , it will be like converting a bullock cart into a handcart .In the end the handcart will be sold to Chathurika free of charge for sure.